We polished off another EU city with a 4 day stay in Krakow. Great food, impressive architecture and Jazz (nice!) filled up our days. It snowed everyday which gave our photos a seasonal finish. There are so many churches in Krakow that its easy to lose track of where you've been. Most pubs, clubs and restaurant seem to be in cellars but all have cheap beer and good food. We spent time in the the old Jewish quarter sampling traditional food. With our backpacker skills in evidence we made good use of local buses and trains to move around the area, including a day out to Auschwitz, below. 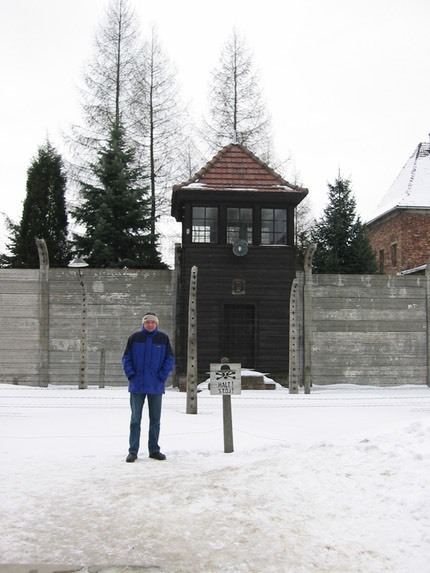 I am here in the grounds of Auschwitz, just outside Krakow with a fresh layer of snow on the ground. not to be missed. There was a lot of snow around when we visited which made for some pretty pictures and snowballs. What we found interesting about Krakow was most bars were in the basement of buildings and had little indication as to what they were. This was how we found ourselves in a leather clad motorcycle club! !